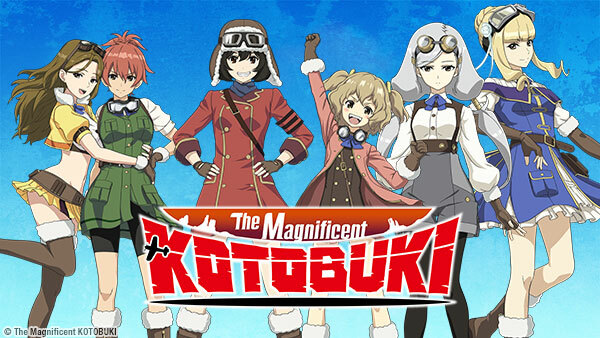 Sign up now to stream The Magnificent KOTOBUKI, subs, tons of dubs, OVA's, simulcasts, plus the all new Dubcast℠ editions and more! Most people rely on water to put out fires, but using a bomb to douse an inferno? Only the KOTOBUKI Flight Corps could think up a stunt like that! Pressure is at an all time high as the ladies of KOTOBUKI Flight Corps fend off more than just air pirates in the air and on land. The squad’s R&R is interrupted when they receive a new mission for triple the regular pay! It’s an opportunity too good to pass up, but does this mean triple the danger? The town of Rahama refuses to sell the Raiden, a powerful fighter plane. Elite Industries won’t accept “no” for an answer. Now, our intrepid heroines must fight back. The squad must somehow infiltrate Elite Industries’ stronghold. Fortunately, a traveling tavern gives Zara a sudden idea. Julia fundamentally disagrees with an idealistic and influential man named Isao. But he apparently has a plan to deal with both the air pirates and the energy crisis. When a solo mission goes horribly awry, Kylie’s skills as a pilot are put to the ultimate test. The KOTOBUKI Flight Corps must transport a rare fish across the skies, but when their mission makes newspaper headlines, air pirates come calling to claim the valuable cargo. Join the Brotherhood of Freedom Union or be bombed into oblivion? Not if the KOTOBUKI Flight Corps has anything to say about it! Dog fight? No, it’s a dog WAR as the KOTOBUKI Flight Corps joins the aerial assault on Isao’s forces and Ikesuka! Bravery. Chutzpah. Derring-do. The KOTOBUKI Flight Corps will need all that and more as the battle in the skies over Ikesuka soars to its thrilling conclusion!